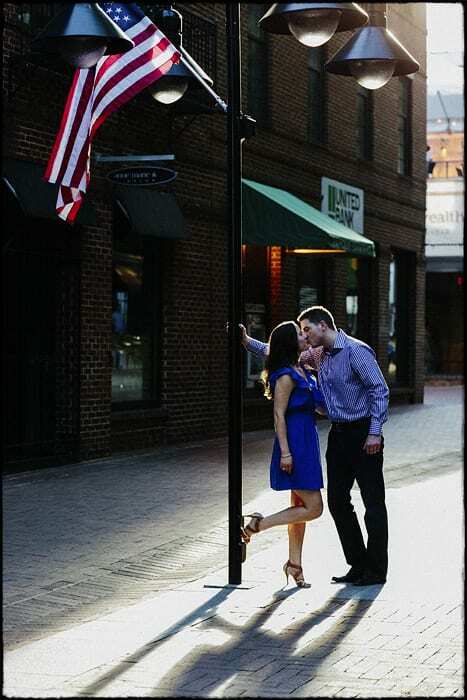 An engagement session is a great time for a couple to have a set of photographs that can differ greatly from the wedding day documentary approach – allowing a couple to enjoya fun afternoon or evening together. It also allows for a opportunity to become accustomed to the camera before the wedding day. Kim, Chris, and I had a fun weekend session walking around Charlottesville’s Downtown Mall and a few surrounding areas. We enjoyed the architecture and obtaining a few portraits throughout the shoot. We stopped to get a drink of water at a fountain on the mall and I noticed a wonderful strip of light as the sun started to lower itself through the buildings. I dropped down to photograph Kim’s shoes and the shadow. One assignment I give my students when I teach photography is to find a color image that is almost monochrome in nature. This is an example of such a photograph – with a subtle blue back-lit by the sun…..a perfect image for our blog this week. The second image is the full body approach at the same location.